In general terms, I’m not really a tennis fan. I don’t mind batting a ball around the court for a bit on occasion, but sitting down and watching it on TV, not really my thing. In fact, I find watching women’s tennis downright annoying – all the grunting and carry on just makes me want to tell them to shut up. Last night, I found myself tuning into the Australian Open Men’s Final midway through the fourth set. Roger Federer was hanging in against Marin Cilic, but as the set came to an end, Cilic looked like he had momentum going into the final set as he broke Federer’s serve and held his own to close out the set. In the fifth and final set, Federer decimated Cilic. Just took his game apart. In the process, Federer became the first man to win 20 Grand Slam titles in the modern Grand Slam era. This was the 200th Grand Slam Men’s Final – Federer has won 20. Think about that, he’s played in 30 finals, 15% of all Grand Slam Finals and has won 10% of the total number that have been played. Here’s the thing I’ve learned about super successful people from watching a lot of sport over the years – there is a time in a game or a playoff series that are “championship” moments. It’s the pointy end of the competition where it always seems like the best players find another gear. In 1987, in the Canada Cup final, Canada vs Russia the game was tied late. On a breakout, Wayne Gretzky, the best hockey player ever to play the game, gets the puck and heads up ice. Trailing him slightly is the second best player of all-time (and my personal favourite), Mario Lemieux. As they approach the goal, Gretzky drops the puck back to Lemieux, who takes the pass and shoots it past the goalie to give Canada the lead late in the game and win the tournament. In 1993, Joe Carter of the Toronto Blue Jays is the team’s best slugger. Bottom of the 9th inning, the Jays are behind with runners on base. If two of the runners score, the Jays win the World Series. Carter gets two strikes on him and then launches a pitch into the bleachers for a World Series winning, walk-off home run. Only the second time it had ever been done in history. Fast forward to 2010, the Olympic hockey men’s final in Vancouver. Canada and the US men’s teams are in sudden death overtime to decide the gold medal. Sidney Crosby, the best player of his generation, grabs the puck for Canada and scores to win the gold medal for Canada on home ice. Crosby’s professional team have also just won back to back Stanley Cups and he’s been the MVP of the playoffs both years – the only other player to do that in the last forty years? Mario Lemieux in the early 90’s. The list goes on and of these amazing athletes that find a way to win in “championship moments”. These people are winners. They might lose occasionally, but their careers are defined by success – they don’t talk about the joy of failing, they are constantly striving for the next level of success. The funny thing, in the “wantrepreneur” space, it’s almost the opposite. 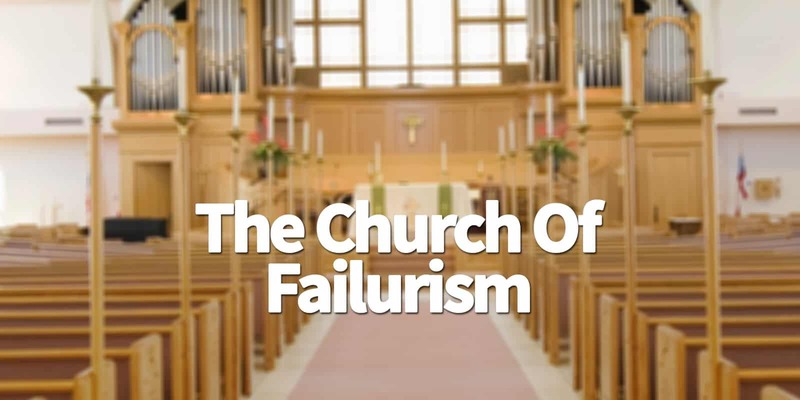 You have these people who worship at the Church of Failure – I often say they are practising the religion of “failurism”. Case in point – someone pointed out the fact that Federer has won 20 Grand Slams in an FB “entrepreneur” group and someone comes back and points out the fact that he’s lost finals more than anyone else. This is someone who is worshipping at the altar of failure. He has taken a long hard drink of the cult’s kool-aid – he believes that failure is the magical path on the road to success. He seeks out failure and revels in it believing whole-heartedly that it was the failures that drove Federer to the ultimate success. And people are fed this line of crap intentionally. It makes them feel “ok” about not succeeding. It gives them the false belief that “success” is just around the corner if they keep failing, they’ll eventually get there. It’s like Hopium – you’ve not REALLY failed, you just haven’t succeeded yet. Don’t believe it. You should always be striving to succeed – every moment needs to be your “championship moment”. When opportunities present themselves, you will fail sometimes, but the reality is, you should not casually accept that. Everything you do should be geared toward maximizing your opportunities to succeed. When you accept failure, you’re buying into failurism and you’ll end up experiencing that way more than you’d like. Winners, win. Losers, talk about the glory of their failures.